The Russian Jewish intellectual, Chaim Zhitlovsky (1865–1943), a leading architect of secular Jewish culture and thought, was a central figure in the progressive Jewish intelligentsia of the late nineteenth and early twentieth century. In an essay written in 1927, “Yidn un Yiddishkayt” (“Jews and Jewishness”), he sought to define the secular essence of what he calls Yiddishkayt. This essay is not the first in Zhitlovsky’s long publicistic career in which he searches for new, secular definitions of Jewish identity and culture. 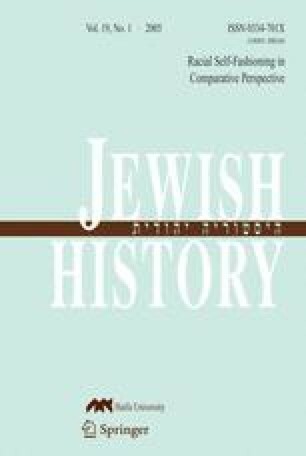 But this essay differs, since it is marked by Zhitlovsky’s use of contemporary “social scientific” notions of race and racial traits to conceptualize what he believes constitutes Jewishness in a non-religious context, along with his adoption of the mystical Jewish concept of the “pintele yid,” the theory of an innate Jewishness embodied by a “Jewish spark.” Zhitlovsky’s desire to craft a truly secular theory of Jewish identity led him ironically to accept models of Jewish identity at odds with his stated larger vision. In turning to contemporary racial theory, as well as long nurtured mystical models of Yiddishkayt, Zhitlovsky reveals the wide range of ideological discourses that led him to innovative and controversial notions of modern Jewish identity.